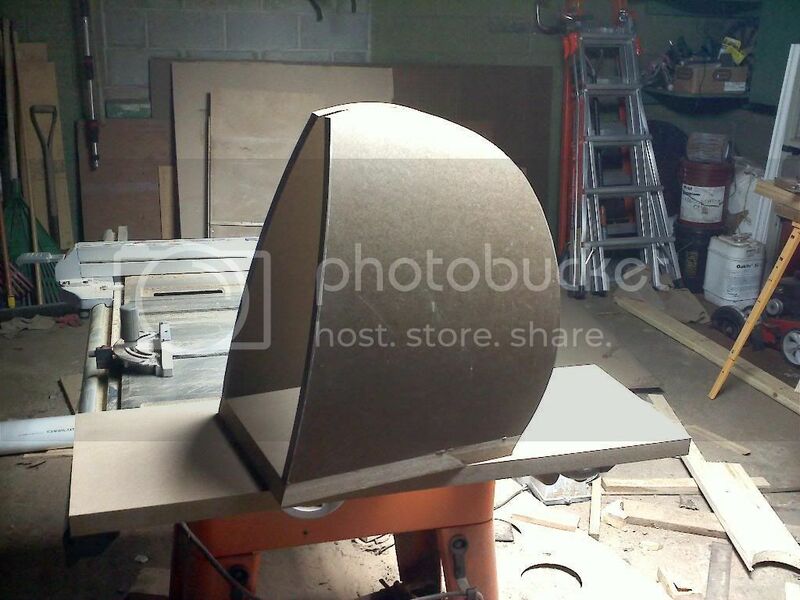 Ed Rosenquist sent me some pictures of the first MiniByzy cabinet construction. 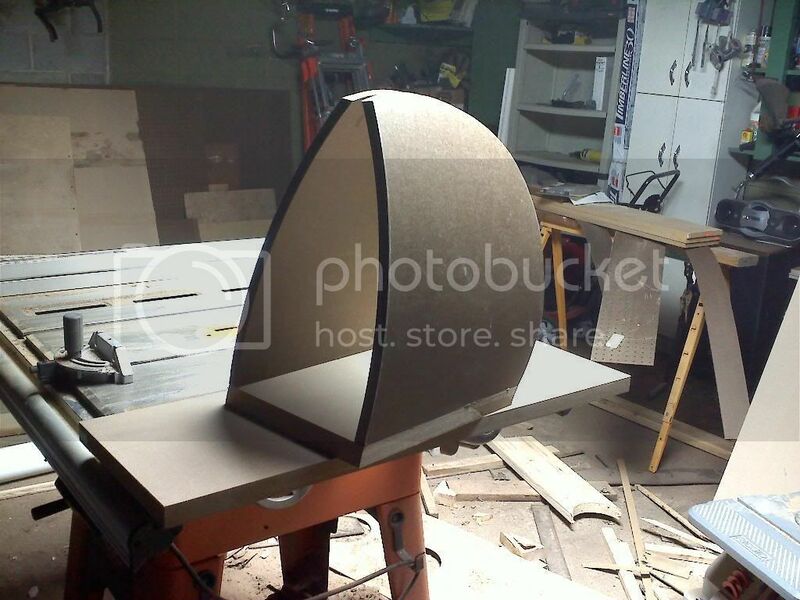 So I thought I'd go ahead and start the build thread to document some of the steps Ed's taken to fashion the incredible cabinets we schemed up a few months back. He's mastered the pre-stressed panel construction technique, which results in fantastically strong enclosures. Being a guitar maker has its advantages as well. Sadly, these aren't for me, but gladly, I get to work on them and listen for a while. You can bet that DoubleTap will be giving his input as well, since he's the source for the Ushers. Should be real stunners when completed. Can't wait to see what hardwood Ed is going to cut the baffles from. Look familiar? 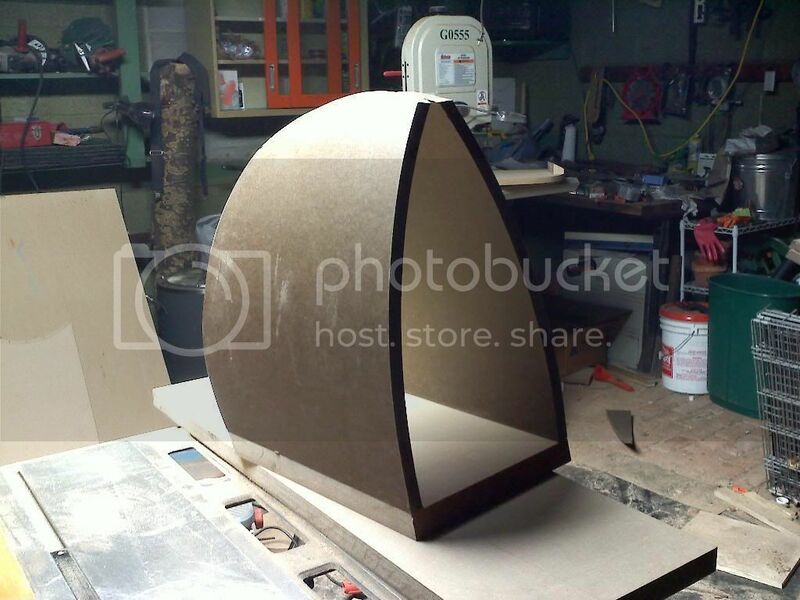 The MiniByzy, 20" tall, 11" at the base, and 16" deep when baffle is applied. Rear mounted woofer and tweeter, with removable solid hardwood baffle with integral 7" waveguide carved into it. Ed says his choice of wood will wait until something moves him when he's in the hardwood store. That will dictate whether paint or veneer goes onto the body of the speaker. Tentative Driver compliment, Usher 8948A, RS28F. Vent on the bottom baffle. 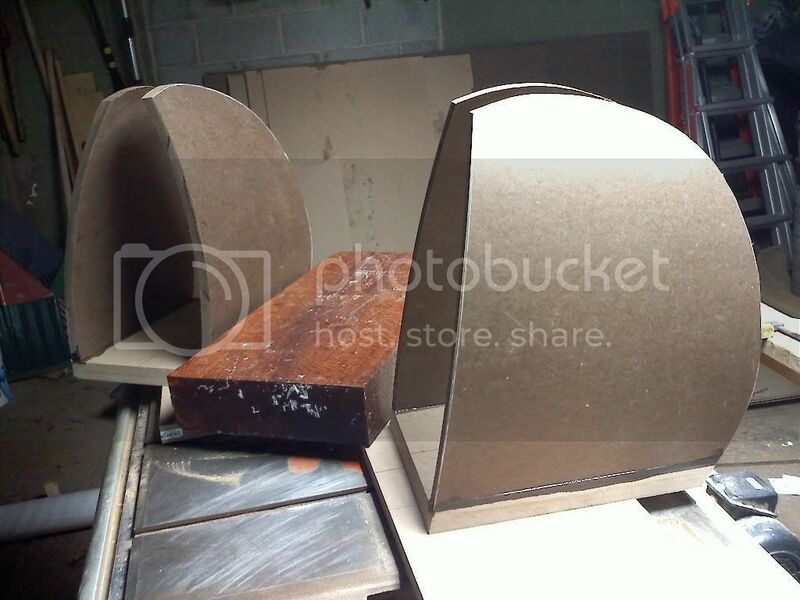 Epoxy/HDF sandwich, pre-stressed, curved panels for the sides, rear/top. Vinyl/aluminum damping on interior walls sealed in acoustic dampening paint. 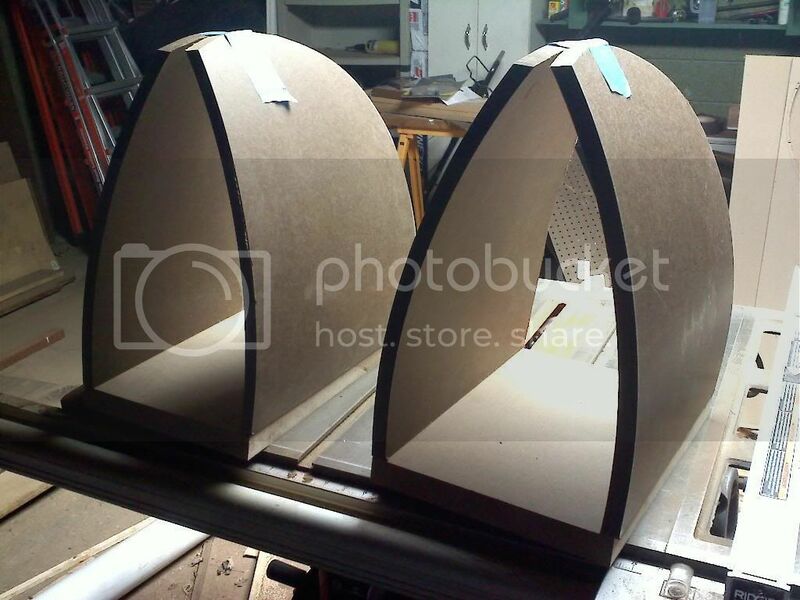 2" Mineral wool acoustic panels on the sides, bottom and rear. Should be right up there with these $2800 Ushers. Very, very, cool, Pete. I don't suppose such cabs will ever be available for DIYers. Any plan to build a matching sub? That is something to look into for sure. 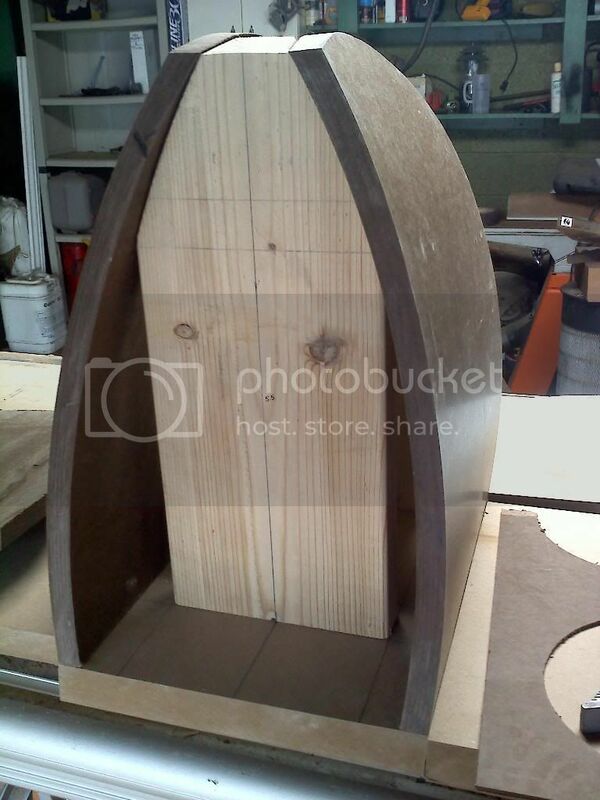 Complimenting that shape could be a real challenge as a bass bin. Those are going to be sweet. I bet there will be a lot of "what was I thinking" moments. Whoa! :eek: I GOTTA clean the garage!!! You and Ed are quite the inspirational fabricators. It's amazing to me that this is perhaps Ed's 4th attempt at cabinet building (I'm sure he'll correct me if I'm off by a mile). He's just a natural. Helps to have the right tools for the job, but he's got a mind for finding the simple way to reach the end goal. Ed's making rapid progress. These will be amazingly strong/rigid cabinets. And he's got some nice plans for interior wall damping. Sides getting glued to the bottom. How the heck were those side panels bent? Very cool :-D Is that hardboard for the sides? Looks like the thin layers (1/16") were bent and laminated in the bent form, then cut. Wait 'til you see top/back on each cabinet. I'll be scratching my head bald asking how he does that. Another update from Ed. Check out the Curly Narra block. 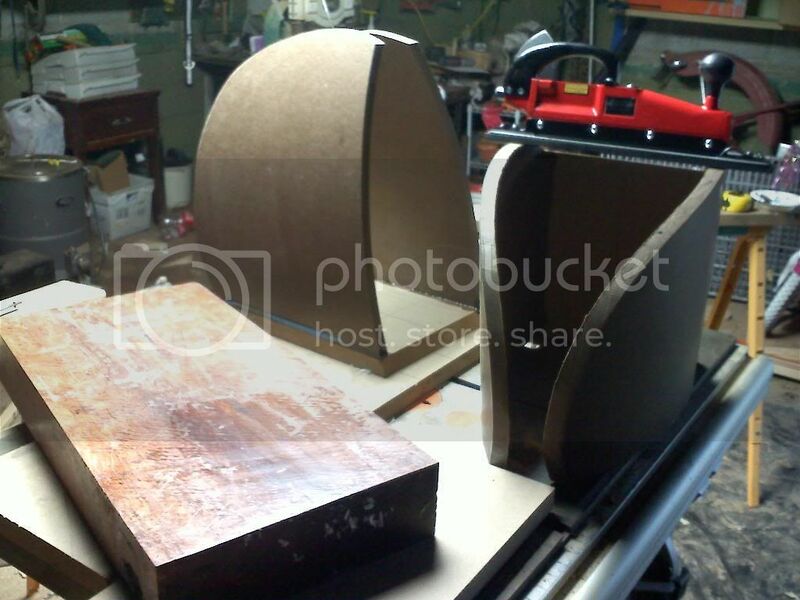 He's going to be slicing that up into a pair of identical book matched 1.5" thick baffles. Really pretty curves on the top view. And check out the new toy!!!! Six, 1/8" HDF boards with epoxy in between each layer. Amazingly strong when cured. Panels are under a LOT of tension as they cure, resulting in a type of pre-stressed panel at the end. It's the hardest cabinet material I've ever encountered that wasn't marble or metal. Think, bowling ball, and you get an idea of how hard and stiff the result is.